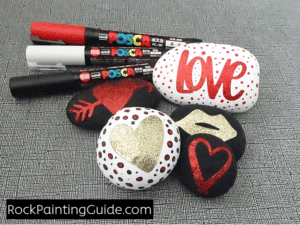 Here is Rock Painting Guide’s first post of 2018, a Valentine’s Day Rock Painting Crafts Roundup. Winter is in full effect this year, so stay warm and cozy inside and why not sit down with your children to craft some really cool gifts and decorations that they can share with their family, friends, and classmates. 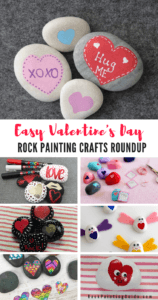 Using Pinterest, I was on a quest to find as many cute Valentine rock painting craft ideas as I could, and I wanted to share this fun and creative list with you. Most of these crafts only require a few supplies that you most likely have lying around the house, so let’s have a rocking good time! Check out these top Valentines craft ideas…. These are so cute, you could almost eat them! My little guy helped me make these sweethearts using Q-Tips to paint the hearts with acrylic paint. Once these cuties dried, I used my Uni-Posca White paint pen and a Sharpie paint pen for the lettering. If I could do it over again, I wouldn’t use the Sharpie, the extra fine point tended to scrape the paint. I love my Uni-Posca paint pens! It just glided gently over the painted heart. This was my little guy’s favorite one to make! We have done this activity before on paper, but then I thought, why not on rocks! So, here all you do is paint your thumb red or pink and overlap the thumbprints making a heart shape. You can use dotting tools, pencil erasers, or even the handle tip of your paintbrush to make the eyes and cheeks. 3. 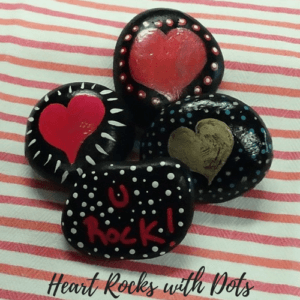 Heart Rock Painting with Dots! 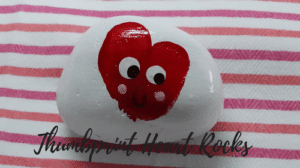 Here are a few simple, easy painted heart rocks. If you read my blog, you will know that it’s focus is on the beginner level and craft projects! Rock Painting Guide hopes to inspire others with creating and sharing rock painting art. In this post, Rock Painting 101 will give you all tips you’ll need to get started. If you are looking for a quick and easy rock craft, this is it! I used these cute Valentine’s Glitter Stickers from Target. If you have a little extra time to spare, go ahead and paint the rocks then apply your favorite sticker, add some dots to fill out the white space. Easy-Peasy! 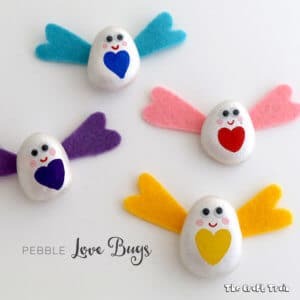 These little love bugs will be a hit with your little ones! 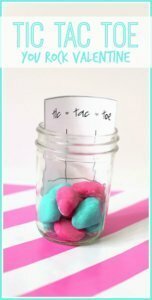 This simple idea is a quick DIY gift that is perfect Valentine idea for little one’s friends or classmates. No Paint, No Problem! 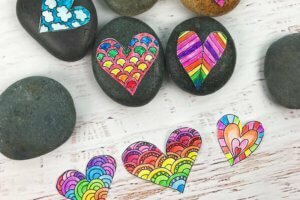 Try this creative heart keepsake rock activity and it comes with a FREE hearts coloring page. This fun game will be a hit with your kids! This includes a printable for the tic tac toe board. Easy and fun way to make handmade Valentine class gifts. 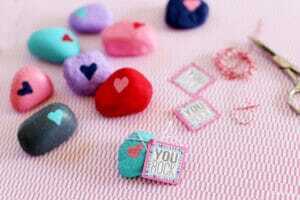 This includes a FREE printable You Rock tag for these wonderful keepsake heart rocks. 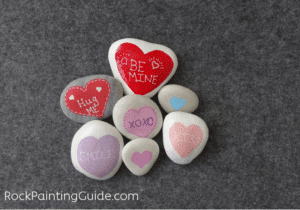 These cute Valentine’s rock painting crafts couldn’t be more perfect to give to your loved ones. If you do happen to make one of these, be sure to let me know how they turned out for you, I’d love to know!